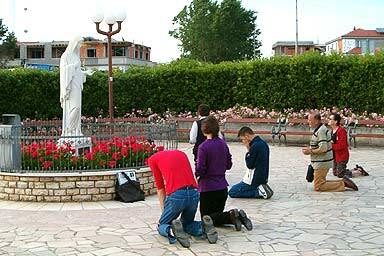 Photo to right: Catholics commit the sin of idolatry when they bow before Mary and pray. Some people claim to be born-again Christians, but they still faithfully attend the Catholic Church. Why? They are eating at the Devil's table. 2nd Corinthians 6:16, “And what agreement hath the temple of God with idols?” I say this caringly. 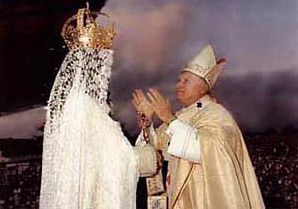 Catholics commit the horrible sin of IDOLATRY when they bow before a statue of Mary. Exodus 20:4-5a commands, “Thou shalt not make unto thee any graven image, or any likeness of any thing that is in heaven above, or that is in the earth beneath, or that is in the water under the earth: Thou shalt not bow down thyself to them...” Catholics commit the sin of idolatry every time they bow and pray to Mary. Why would a Christian want to continue in such wickedness? How could Catholics be so arrogant, so blind, and so apostate as to believe that salvation is found in Mary? Jesus tells us the answer in Mark 7:9, “Full well ye reject the commandment of God, that ye may keep your own tradition.” People remain in the Catholic religion because THEY CHOOSE TO, period, even in full knowledge that they are going against the Word of God. God will judge them! Just as the Pharisees of Jesus' time CHOSE to follow the hellish religion of Judaism instead of Biblical Christianity, so do Catholics CHOOSE to follow the Satanic Catholic faith instead of the Bible. I tell you, Catholicism is of the Devil. Catholic priests are infamous for discouraging people from reading the Word of God. They don't want anyone thinking for themselves. But Jesus commanded us in John 5:39, “SEARCH THE SCRIPTURES; for in them ye think ye have eternal life: and they are they which testify of me. And ye will not come to me, that ye might have life.” What precious Scriptures! Jesus told the crowd to SEARCH THE SCRIPTURES, and in so doing they would learn how to have eternal life; but by rejecting the Scriptures, they had refused God's plan of salvation. Is this not exactly what Catholics are guilty of? Yes, that is exactly so! Catholics adhere to a FALSE gospel of self-righteousness and sacramental rituals. If you know that the Catholic religion is teaching lies, and they certainly do, then you shouldn't be supporting their church (which is no real Church at all). James 4:17, “Therefore to him that knoweth to do good, and doeth it not, to him it is sin.” It all boils down to whether you are going to please God or continue in the unbiblical traditions of men . . .